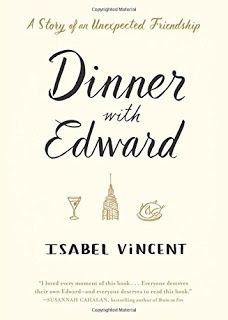 I am currently hosting our bimonthly edition of Cook the Books Club, Dinner with Edward: A Story of an Unexpected Friendship, by Isabel Vincent. This was a book I read last year, and at my re-reading had to wonder - how does one compose a proper tribute for a guy like Edward? However, our author has totally nailed it. I feel as though I was graced to know a wonderful man, just a bit, through her poignant memoir, She brought him to life for us. Though it was also about her, and what she was going through at the time, that story served as a fine contrast and underscore to Edward's own character, his concern, compassion, ability to love, and enjoyment of life, which he is able to gradually regain after the death of his great love and wife, Paula. Isabel's old friend, Valerie, is worried about her grieving father, as as she and her sister are both out of the country. Valerie asks that Isabel look in on him occasionally. When she does, he invites her to dinner. The book serves as a chronicle of their developing friendship and the dinners he prepared for her, with menus heading up each chapter. "The secret is treating family like guests and guests like family," And she continues, " No matter how terrible I felt in the moments before I knocked on his door, I always left Edward's apartment with a smile on my face, a sensation that I had just experienced some kind of pure joy." 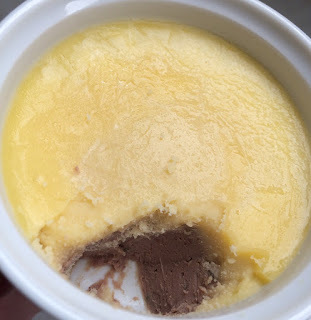 Well, I have made chicken liver pate, but not right at this point in time. I'm attaching a photo of it though. Mine has cognac included as well, and is from Elizabeth David's recipe. Next adjustment - the flounder - which I couldn't source, but changed out for cod, and instead of Riesling, there was my Carambola wine. Nonetheless it all came together wonderfully. I am doing things in a more relaxed mode these days, thanks to a terrific cookbook, Food52 A New Way to Dinner, by preparing parts of a meal ahead of time. What a terrific Cookbook. I keep telling myself, "You do NOT need any more cookbooks Claudia!!" 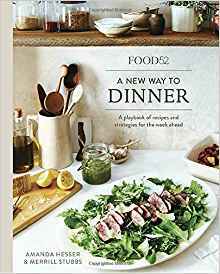 - however we are making an Executive Exception for this one - A New Way to Dinner, by Amanda Hesser & Merrill Stubbs, sub-titled, A Playbook of Recipes and Strategies for the Week Ahead. This was actually my first acquaintance with Food52. At the present point in time, I've composed (yes, they're artistic compositions) a number of the recipes in this book, starting with that one shown on the cover, Steak with Arugula, Lemon and Parmesan. In addition, there were Grilled Pork Chops with Hacked Romesco, which I double hacked, doing a more Mexican take with tomatillos, some wonderful Chicken Fingers (yes, home-made and delicious), Tad's Roasted Potatoes, which I converted to Claudia's Roasted Cassava, a lovely Braised Chickpeas with Celery (another adaptation using lentils instead), some wonderful meatballs (Bob's favorite), the Brussels Sprouts Salad with apples and Anchovy Dressing (pictured below), the wonderful lamb merguez with preserved lemon cream, and my featured Spicy Roasted Cauliflower. 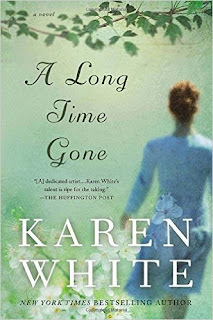 This novel, A Long Time Gone, by Karen White, takes place in the Mississippi Delta, my okra is getting harvested, and I was in the mood for Gumbo. Life working in concert. I'm calling it Hawaiian style because there is Ahi tuna in it, Kauai shrimp and vegetables from my Hawaiian garden. Most traditional gumbos won't have fish other than shrimp and crab, but as Bob is picky about shellfish generally, I have been adding in fresh ahi to various dishes that call for shellfish. So we're both meant to be happy. Theoretically. 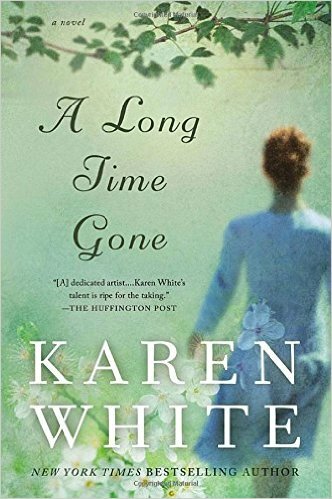 I do believe this is the first book by Karen White I have read, and will certainly be reading more. She is an excellent storyteller. 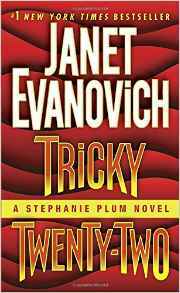 Her novel involves a family where it seems the women always leave their children behind at some point. They come back and often leave again. It concerns the emotional damage and the danger of relying on assumptions about the motives of others, frequently false assumptions, rather than giving the benefit of doubt, until we know better, also the need for forgiveness,and letting go of bitterness. As the Publisher's blurb states: "When Vivien Walker left her home in the Mississippi Delta, she swore never to go back, as generations of the women in her family had. But in the spring, nine years to the day since she left, that's exactly what happens --- Vivien returns, fleeing from a broken marriage and her lost dreams for children." White weaves together seamlessly the family relationships, and Delta history going back several generations, up to and including the recent broken tie with Vivien's step-daughter. Then there is the mystery of a woman's bones found under a lightening felled cypress in the back garden, as well as a new romance with an old love. Terrific reading. 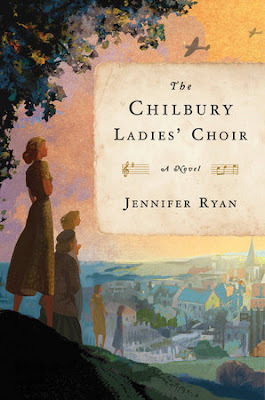 Jennifer Ryan's debut novel, The Chilbury Ladies' Choir, is just marvelous, so inspiring and heart-warming. A World War II tale, involving the women of Chilbury in Kent, who have been left to manage on their own, with most of the men away fighting. How, with the encouragement of a new singing teacher, they re-organize their disbanded Village choir, in defiance of a notice posted at the Village Hall by their Vicar. "As all our male voices have gone to war, the village choir is to close." That bold little turnaround is just the beginning. Singing competitions, and concerts soon follow, cheering and lifting hearts in a sad, dreary time, as they put aside differences and learn to rely upon and draw strength from God and their own inner resources through music. A bit reminiscent of Maeve Binchy, Ryan follows individual members of the choir in a pivotal year - 1940, with excellent characterizations, through diaries, letters and journals. We see in these pages women and young ladies developing character, wisdom and maturity, with occasionally gripping, emotionally stirring, even humorous, and interconnected village life stories, which draw the reader in. My interest was held throughout. There is mystery, a love story or two, bossy individuals, tragic death, greedy looters and spies. These are not perfect people, but people tried, enduring and growing through their circumstances. Music provides a unifying, comforting common bond. As their choral director states: 'Music takes us out of ourselves, away from our worries and tragedies, helps us look into a different world, a bigger picture." Kitty, the Choir's 13 year old, talented lead soprano notes in her diary, "Does Hitler have any idea of the force and determination of 13 impassioned women? At the very least, I suspect he's never considered the lethal potential of a three-tiered cake stand." They had been practicing self-defense with objects to hand during a WIC (Women's Invasion Committee) meeting. 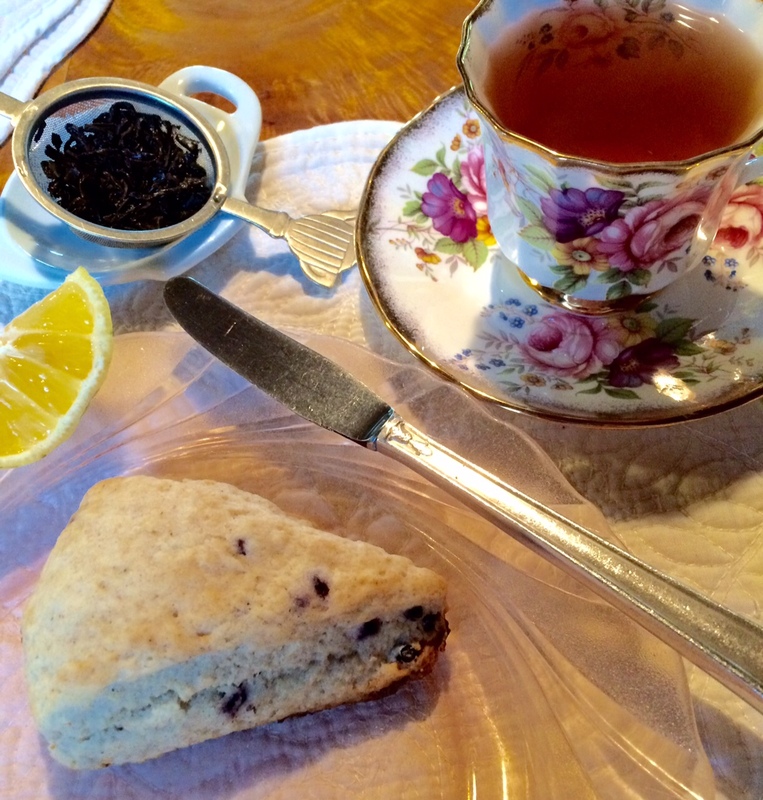 And always, throughout, there is the traditional English comfort - A Nice Cup of Tea. Here, mine is Lapsang Souchong, and with a scone. I made a batch of blueberry ones. Recipe to follow, for those interested. "The funeral home is on the edge of the Burg, short for Chambersburg (NJ). Originally the Burg was a mob enclave, but most of the mob has now moved on to classier neighborhoods...I grew up in the Burg, and my parents still live there. Houses are modest. Bars are plentiful. Crime is low. Gossip is rampant. The funeral home is the Burg equivalent to a country club. It's free entertainment for everyone but the immediate family of the deceased. People in the Burg go to viewings for the cookies, not for the dead guy in Slumber Room No. 2."